Fig. 1: Issue 22 cover. While reading Stephen King’s Danse Macabre for inspiration for this project, I ecstatically stumbled upon multiple mentions of Castle of Frankenstein (CoF). King compliments CoF for its “fairly sophisticated reviewing[,]” saying that it was “the best of the ‘monster mags’ and one that died much too soon” (142). There are traces of CoF throughout the internet – in fan blogs and on collector websites – but recognition from one of horror’s most recognized authors is perhaps the most monumental evidence I found when trying to gauge CoF's legacy. It truly speaks to the imprint CoF made on the world of horror and on horror fans. For these reasons, this project will focus primarily on CoF's contribution to, and place in, the world of horror. 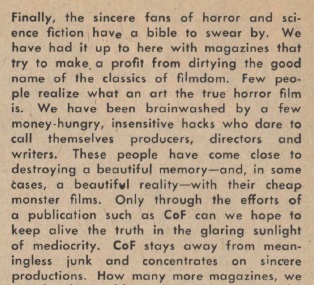 CoF is most interesting to me as a publication which promoted passionately the allure and adoration of horror. 22, 23, 24, and 25. Issue 25 was Castle of Frankenstein’s last in 1975.
industry, and inevitably found its place in horror's history. An array of terminology classifies Castle of Frankenstein: magazine, journal, fanzine, fan magazine, film magazine, filmzine, etc. In Stephen King’s Danse Macabre, King calls Castle of Frankenstein a “journal” (196). 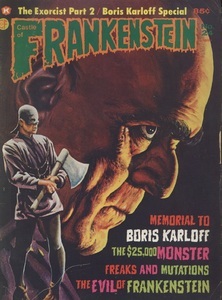 However, Castle of Frankenstein takes many of its features and much of its style from fanzines. And yet, in its most simple form Castle of Frankenstein is, perhaps, a magazine. 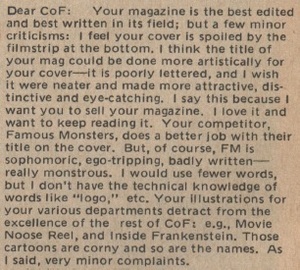 It is arguably most easy to rule out CoF’s classification as a fan magazine. 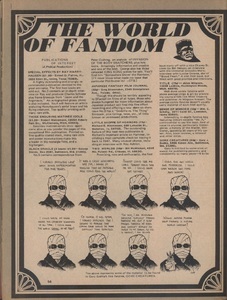 Although CoF is dedicated to its readership—the fans of films—and, according to Anthony Slide, author of Inside the Hollywood Fan Magazine: A History of Star Makers, Fabricators, and Gossip Mongers, “a fan magazine [is] fundamentally a film- and entertainment-related periodical aimed at a general fan[,]” (11) there are some elements that eliminate it from this category. For one, fan magazines were aimed at “an average member of the moviegoing public who more often than not was female” (Slide 11; my emphasis). Anthony Slide also notes that although “film buffs might be the primary purchasers of old fan magazines today, they were not originally targeted as the primary audience” (11). CoF, as I will later argue, is predominantly concerned with those fans we would label as "film buffs"—the "intellectual" fan who sought details and analysis (although these elements could sometimes be found in fan magazines as well). 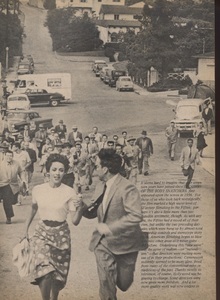 In the 60s and 70s, fan magazines often focused on the human interest side of film; they wanted to convey to the reader the social lives of actors and actresses—content they were often criticised for—similarly to the modern day gossip magazine (Slide 184). This criticism predominately manifested when editors would manipulate titles to imply “more scurrilous content” than the actual story told (Slide 185). Below are images of Photoplay, one of America's first fan magazines for film which ran from 1911-1980, and another holding in the University of Victoria's Special Collections. 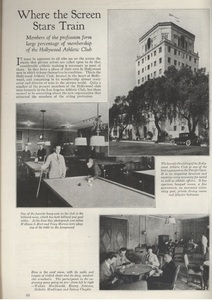 The captions below each image explain how Photoplay exemplifies a fan magazine. Over the course of this page, it will become obvious how CoF differs from these characteristics. 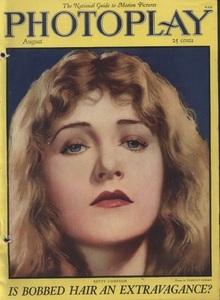 Cover of Photoplay (Vol. 6, No. 1) featuring prominent silent film actress Leatrice Joy. 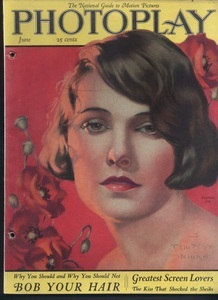 Almost all of Photoplay's covers featured young female actresses. 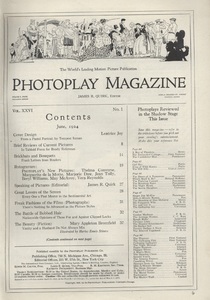 An example of a table of contents from Photoplay. Note the emphasis, again, on female stars, femininity, beauty, and romance. 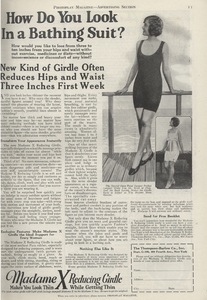 Image from the advertising section of Photoplay which highlights a girdle that slims one’s waist while wearing a bathing suit. Advertising in Photoplay was predominately directed at a female audience. An article detailing the fitness habits of actors and actresses. This article tries to communicate how glamourous Hollywood life is by highlighting the elite Hollywood Athletic Club, but it simultaneously tries to humanize actors and actresses with their commitment to physical fitness in order to maintain the interest of the average American citizen. This is reminiscent of the reoccurring feature in modern day US Weekly: Stars—They’re Just Like Us! “For me, the impact of fanzines was reminiscent of an old legend. all the solemn churchbells of the city with tinkling sleigh bells. Where CoF fits best is perhaps under the classification of fanzine. In fact, one of CoF’s editors and designers, Bhob Stewart, calls CoF a “zine” in an interview he did in the late 70s on Flickhead (a now defunct website featuring the writings of web critic, Raymond Young). 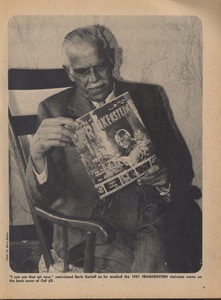 Fredric Wertham, in The World of Fanzines, defines fanzines as “uncommercial, nonprofessional, small-circulation magazines which their editors produce, publish, and distribute” (33). CoF was published by Gothic Castle Publishing, a creation of CoF’s editor and inventor, Calvin T. Beck. 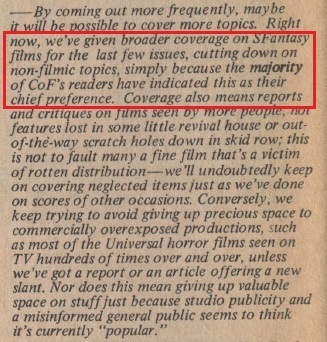 It’s mentioned in Calvin T. Beck’s interview with Flickhead that CoF was originally distributed through Kable News; although it’s unclear if the magazine stayed with them throughout the entirety of their run, CoF also seemingly ended under Kable News' umbrella. When reading letters to the editor in CoF, we can see that the magazine was distributed all over North America, including Canada. However, CoF’s distribution was irregular and scattered at best. This reflects Wertham's note that fanzines “are not commercially oriented [and] may come out irregularly” (33). Wertham explains the importance of small circulation in the classification of the fanzine genre: “[i]n contrast to mass media and mass circulation publications—which of course have their place in our society—fanzines are intended for small audiences. We have built up an enormous communication machinery which at times confronts us like a superior power and, paradoxically, contributes to our isolation. The individual is apt to be submerged and regarded as a statistic. There is no such tendency in fanzines” (35). CoF relied on its readers to build its community, and its community was limited to fans of horror (as well as sci-fi and fantasy) who appreciated the genre in various mediums, not just film (although that was the predominant focus). Readers of CoF played an active role in its success and even, as we will see later, its content. This readership community is best illustrated through the letters to the editor that appear in CoF, which are vital to fulfilling CoF's classification as a fanzine: “Letters to the editor are one of the most important and distinctive components of fanzines. They embody the principle: ‘Our words are to people from people’ … Readers write the editor, they engage in discussion with other letter writers, editors write to each other. Whereas in the commercial press editors and publishers feel that they confer a privilege—which they often withhold—on anyone by printing his letter” (Wertham 97). 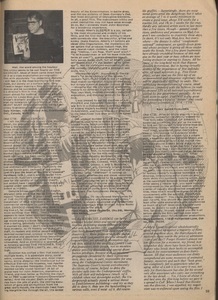 There is also the unique characteristic of fanzines in that "the editor sometimes inserts his [or her] own comments, humorous or critical, in brackets in the text of the letter" (Wertham 98). See especially Figs. 31 and 32. CoF also mirrors the standard contents of a fanzine: “fiction, interviews, letters, cartoons, strips, etc. The different departments are not necessarily strictly divided and there is no set pattern for their arrangement in an issue. Nor do all the various features appear in every fanzine” (Wertham 92). Wertham continues to note how none of these features are exclusive to fanzines—they are in many popular, mass-produced publications—but the way they are presented and their frequency (or lack thereof) develops its own individuality under fanzines (92). Example of CoF content and layout. Who was Castle of Frankenstein? Since I hadn’t expected to get credit, I was startled to see that Cal had me down as ‘art editor’ in the printed mag. To me, it looked pretty wretched and hastily done. Therefore I began work on the next issue simply because, with my name on the masthead, it seemed necessary for me to produce something that didn’t look second rate. Stewart’s description emphasises the humble beginnings of CoF, which are explicitly reminiscent of the homemade efforts made by most fanzine editors/publishers. Stewart would work on CoF periodically throughout its lifespan with varying writing credits. In the interview conducted by Raymond Young, Stewart notes that by issue 6, the first issue in UVic's collection, CoF had “a few writers with critical sensibilities, and Cal and [Stewart] [had] developed an interesting collaborative system”. There were other notable contributors to CoF—notable in name. 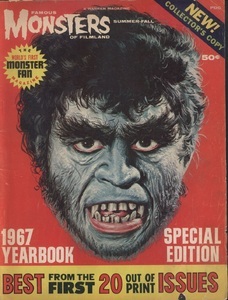 Robert Michael Cotter’s book, The Great Monster Magazines, notes how CoF “had an ‘A’ list of contributors, many of whom would go on to become leading lights in the field of horror film scholarship, like William Everson (Classics of the Horror Film, More Classics of the Horror Film), Ken Beale [mentioned above] and Richard Bojarski (The Films of Boris Karloff), Chris Steinbrunner, and Jim Harmon. Also appearing were Larry Hama before he became a comic book artist, and even Joe Dante before he became a director” (59). the birth of Castle of Frankenstein in the 1960s. Fig. 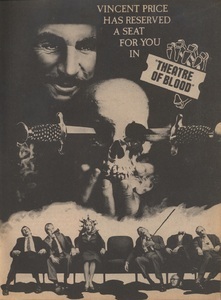 4: Vincent Price in Theatre of Blood (1973); Example of 1970s film content featured in CoF. Fig. 5: Boris Karloff, iconic horror actor, reading Castle of Frankenstein; Karloff is best known for playing Frankenstein's monster in Frankenstein (1931)—a film which inspired many of the monster movies which followed. Fig. 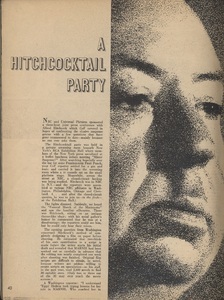 6: Article detailing a press conference with Alfred Hitchcock, legendary director of Psycho (1960). Fig. 7: Article paying tribute to beloved actor Bela Lugosi, best known for playing Dracula in Dracula (1931)—a role which inspired many of the horror films which followed. Castle of Frankenstein offers fans and scholars of the horror genre a window into a specific era of horror and a front row seat to watch the unravelling of the new direction it would follow. To understand the content in CoF, we must first understand where it was situated not just on the timeline of horror, but on the timeline of film culture and production. The 1960s were a particularly turbulent time for the film industry; it was a time of change, and there was a fervent need for all of those involved in the medium to adapt. As Paul Monaco notes in History of American Cinema: The Sixties: “A studio such as Paramount, for example, which once had produced more than a hundred films per year, averaged just fifteen features annually during the 1960s” (10). This was largely due to the fact that, as stated by Kendall R. Phillips in Projected Fears: Horror Films and American Culture, in 1948, the “Supreme Court ruled that the [five biggest studios—MGM, Paramount, Twentieth Century Fox, RKO, and Warner Brothers—] would have to sell off their theatre chains” which meant that “as these major studios [were] no longer assured of profitable theatre space, [they] focused on making fewer and ‘bigger’ pictures” (91). Another significant change, which required adaptation from the industry, was how in 1959, 86 percent of American homes had a television (Monaco 16). Production companies were concerned that this advancement in home entertainment would “undermine” the “social habit of regular family excursions to the movies” (Monaco 16); however, although “[t]elevision had taken away much of the mass audience from movies in the 1950s, [it] become increasingly dependent on the motion picture industry’s product and its production values for much of its prime-time programming by the end of the 1960s” (Monaco 17). Monaco acknowledges, however, that although movie theatre attendance began to drop before the popularity of TV, television was still a cause of low theatre attendance (40). For example, “[w]here television first became available movie attendance declined most quickly [and] [w]henever an additional broadcast channel was added in any market, the decline in movie theatre attendance accelerated immediately and spread the most rapidly” (Monaco 40). As Mondaco argues, due to fewer people attending movies, Hollywood dropped the double-bill from theatres and focused on one major film—this meant that companies produced fewer movies and possible failure of the films brought greater repercussions (Monaco 10). The change in the number of films being produced, however, opened the door for independent films to prosper, which in turn opened the door for a new breed of horror films; these filmmakers “push[ed] lower-quality, though more daring, films into American theatres" (Phillips 91). 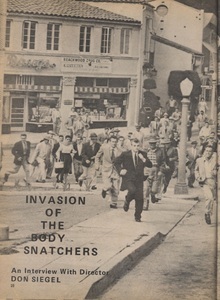 For example, the George A. Romeo film, Night of the Living Dead (1968), had a mere $114,000 budget—the production “group chose horror because of its potential for profitability” (Phillips 82). Another positive for horror that arose instead from the changing social culture of the 1960s was how “[b]y the end of the [1960s], industry pundits claimed that features aimed at the ‘family’ market could no longer attract the adolescents and young adults who had become the mainstay of the movie theatre box office” (Monaco 44). 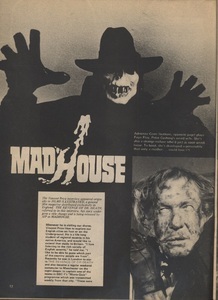 The need to market to younger audiences made horror, with its unique violence, gore, and commentary on human nature, all the more appealing for the film industry to produce. In fact, “[a]s early as 1961, Variety had begun publishing obituaries for the Hollywood happy ending: ‘The sicko ones are making for box office health more readily than the happier movies’” (Monaco 44). This was the breeding ground for an alternative genre like horror, and a magazine like Castle of Frankenstein, to flourish. In the 1960s, Psycho (1960) firmly gave horror its chance at rebirth: “As the French New Wave director Francois Truffaut remarked, Psycho ‘was oriented toward a new generation of filmgoers’ and was premised on an aesthetic that was fundamentally new. Psycho has been called ‘the movie that cut movie history in half’[;] The precise moment at which that division occurs is in the famed motel shower scene when Janet Leigh’s character, Marion Crane, is stabbed to death” (Monaco 189). 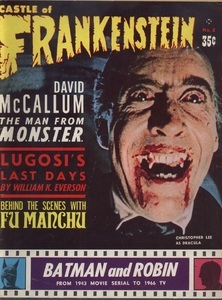 Two years after the release of Psycho, Castle of Frankenstein produced its first issue. What did advertising in Castle of Frankenstein look like? readers (the horror fan base)? contribute to the community of horror and fanzines? Fig. 10: A feature within CoF which suggested other publications which may be of interest to CoF readers. I was expected to put together a magazine, without spending anything, by assembling existing material. Naturally, this made it difficult to solicit from writers and artists, since I couldn’t guarantee anyone what or when they might be paid, or even if they would be paid. This explains why the magazine used photo covers during the time I was editor—no one had to be paid. 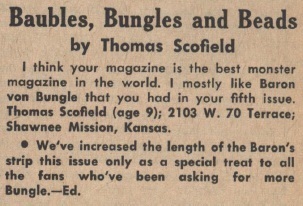 However, in CoF there were advertisements for products that went through Castle Publishing. Fig. 12 and 13 in the gallery below show how CoF sold horror related props and toys, ranging from 75¢ to $4.98, as well as memorabilia and collectibles, ranging from $3.50 to $7.00. This money went directly to Gothic Castle, as the mailing information shows us, although it’s unclear if the money was further distributed to whoever supplied the products. Regardless, it’s fair to assume that CoF made some money off this business venture. These ads appear, in some shape or form, in each issue (at least those in UVic's Special Collections). 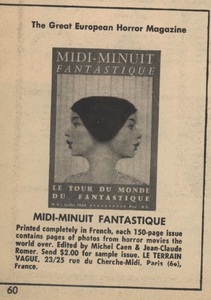 Readers of CoF could also purchase 8mm films (See Fig. 11 below). The purchasing of the films again went through Gothic Castle, marked at $5.95 each, although it's safe to assume Gothic Castle was not producing 8mm films—they were likely brought in from outside sources, and it's unknown if this procured any profit for CoF. CoF's interest in selling 8mm films could arguably have been not only out of recognition of their readers who are ardent film buffs and collectors, but their recognition of the fact that more and more people were watching films in their homes. It's a recognition of how, to stay alive and relevant, CoF sought to appeal to all modes of film viewing. CoF also posted advertisements for collectables through their CoFanaddicts Gallery. This was a free service where fans—no professionals—could write to CoF with wanted and sale ads. Such ads would be accompanied by the reader’s mailing address so that other readers could seek them out directly. The service also allowed readers with similar interests to communicate with each other simply for correspondence purposes as well. The CoFanaddicts Gallery was a monumental factor in maintaining CoF's sense of community. 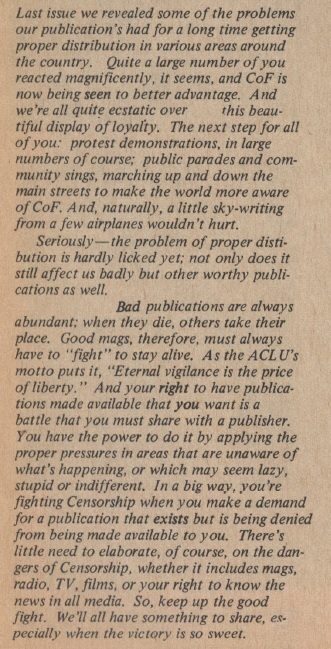 Before it was the CoFanaddicts Gallery, however, this section featured at the end of the section for the letters to the editor, and shared space with advertisements and acknowledgements of other fanzines and magazines. Eventually, this idea of suggesting to readers other publications which may align with their interests (and feature content similar to that of CoF's) would grow to be its own feature as well (See Fig. 10). The acknowledgment of other fanzines is another element which positions CoF as a fanzine. 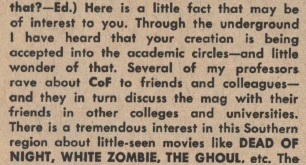 Wertham explains that it was common for “fanzines [to] review other fanzines” as “fanzines have a quality which makes them a special phenomenon in our communication setup” (111, 112). Fanzines “are critical but not destructive. Instead of belittling one another they try to further each other’s interest. They often give what they call a ‘plug’ to other fanzines … [Overall,] they represent an attitude which is healthy and decent” (Wertham 112). What's important to note about the aforementioned content is CoF's commitment to focusing on horror-related items. Their advertising content was focused on their reader being a fan of a particular thing—in this case, horror. It did not assume or cater to a reader's gender, age, or other identifiers. The content, no matter the medium, was targeted towards fans of horror. This will be touched on again in the Audience section. Fig. 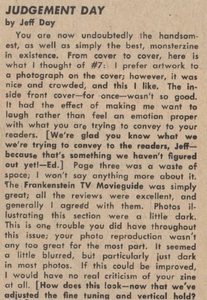 16: Beck's reply to a reader explaining that CoF readers want, or prefer, film content. Fig. 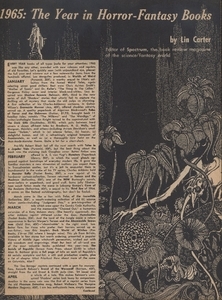 14: Lin Carter's overview of horror-fantasy novels released in 1965. Fig. 15: CoF's article on radio dramas. CoF also gave, albeit irregular, attention to radio, literature, and comics. The magazine predominately did this through advertisements, feature articles, and reviews. Lin Carter periodically wrote book reviews for CoF. Fig. 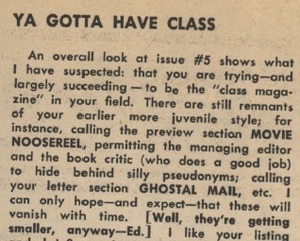 14 shows Carter's article where he highlighted and reviewed "noteworthy" novels released in 1965. Adjacent to this image, in Fig. 15, is CoF's feature on radio drama—"On the Air"—which focused on radio shows from the sci-fi, fantasy, mystery, and horror genres. 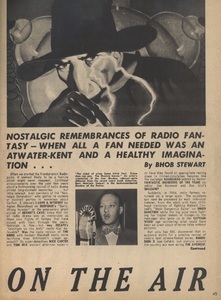 Articles such as "On the Air" took on nostalgic tones, arguably appealing to older fans looking to reflect, but it also offered insight for younger generations who were not privy to such fond memories of radio. These articles were symbolic of CoF's conscious effort to appeal to fans with interests beyond film. It is also possible that CoF not only wanted to pay tribute to the earlier mediums which bred the films many had grown to love, but they wanted to offer a history of genre as well as an interesting commentary. Being, however, that CoF was predominately a film magazine, it did not give more than a few pages to a feature focusing on media other than film. Fig. 16 shows an excerpt of a reply made by Calvin T. Beck to a reader, Gary Kimber, who was concerned that CoF wasn't giving enough attention to content outside film, and that their film content was nearing on repetitive (52). Beck insists in the excerpt that CoF's commitment to film stems not just from the editor's and contributor's interests, but from the preferences of readers. 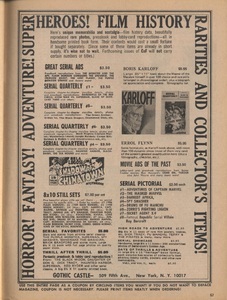 One particular concern of the reader was comic book reviews, to which Beck argued later in his reply that "while there are probably 175 thousand comics fans and collectors ... there are probably at least fifteen million SFantasy film fans—and that's not even counting general audiences and those watching TV who are marginally addicted" (52). This was Beck's justification for deciding which subjects CoF's time and energy would be spent on. genres in CoF: sci-fi, fantasy, and horror. Fig. 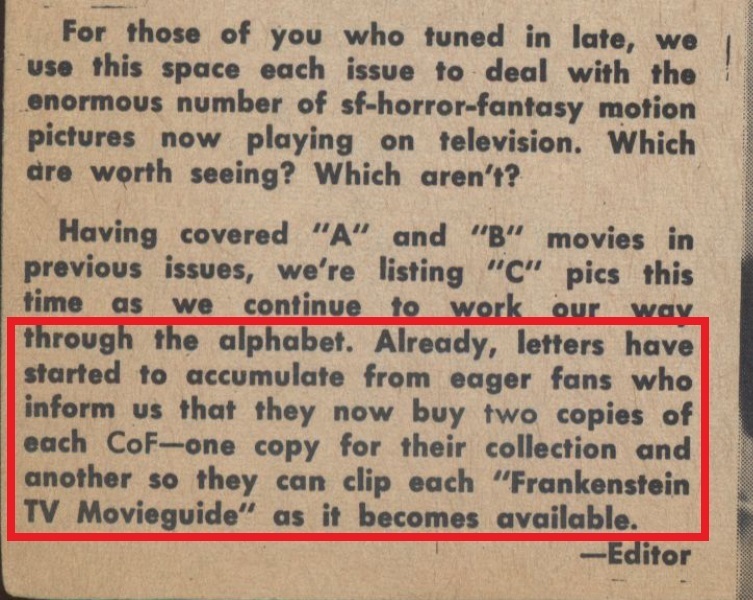 17: The editor highlighting the success of the Frankenstein TV Movieguide. Fig. 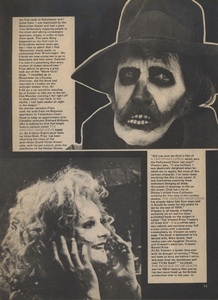 18: Full page feature image for the Frankenstein TV Guide. Fig. 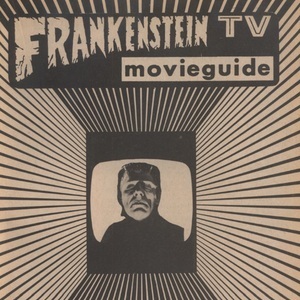 19: General layout of the Frankenstein TV Movieguide. In the above section, Beck notes that film fans were extending their viewing of films to TV as well. CoF’s acknowledgement of this, however, went beyond a continued commitment to primarily focus on film in CoF—they also invented a reoccurring article titled the Frankenstein TV Movie Guide. I had familiarized myself with most of the pictures in Cal’s ever-growing files. [It] struck me that many of these pictures might never see print. Around this time a new director had taken over the Museum of Modern Art’s film collection, instigating a policy of showing every film in the MOMA collection alphabetically. Inspired by this, and dissatisfied with the unorganized film listings in early CoF's, the CoF Movieguide was born, beginning in 6. It was all just a scheme to print the best stills from Cal’s files! And this endeavour of CoF’s was extremely well received. As noted in Fig. 17, readers soon started buying multiple copies of CoF so that they could keep one copy for collecting purposes, and have another to tear out the movie guide from. 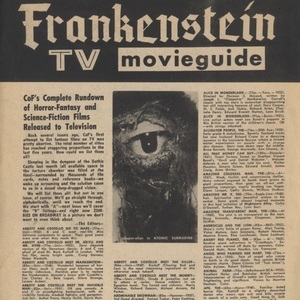 The Frankenstein TV Movieguide also helped fuel the community surrounding CoF. Readers would frequently write to CoF to contribute to the list or mention films that the editors had missed. 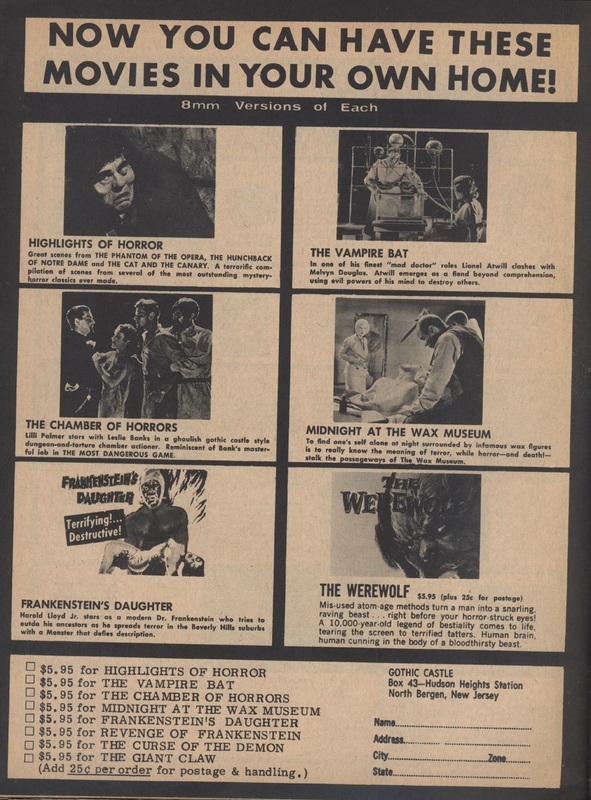 Therefore, the movie guide was not only engaging with the changing climate of the film industry, and thus keeping CoF alive with readers buying multiple copies, but it was also contributing to horror culture and its relevancy and growth. Arguably, such a guide was best received by the 'film buff' horror fan of CoF, as such cataloguing exemplified their affection for a meticulously detailed pursuit of knowledge about horror film. Fig. 20: Description of the "Gothic Castle" dungeon. Fig. 21: Igor Hyde... before the spelling of his name was corrected in the next issue to Ygor. 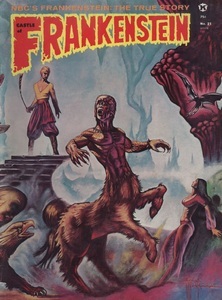 Outside of marketing, another way that CoF engaged with their readership is through the creation of a "Gothic Castle"—or “Castle of Frankenstein”. Within its pages, CoF built its own narrative that would interact with the reader. The characters they invented within said narrative helped maintain CoF alongside the editors, like employees. While also being an example of humour this narrative is, most importantly, read as a vision of horror. For example, in Fig. 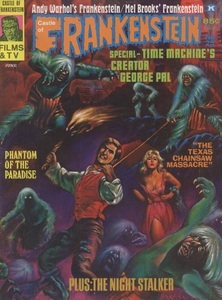 20, which is taken from the explanation given for the invention of the TV Movieguide in issue 6, the editors indicate that they are working in the dungeon of the Gothic Castle; growing the horror theme, they also reference a torture chamber and use language such as “screaming” and “dazed sleep-drugged vision”. Vincent van Ghool (Fig. 23), the ghoul who presided over CoF’s CoFanaddicts Gallery, is one of CoF's reoccurring characters. Although the CoFanaddicts Gallery's first appears—as per UVic's holdings—is in issue 9, Vincent does not appear in UVic's issues of CoF until issue 20. However, there is evidence of him in an earlier issue: issue 15—interestingly, Beck's signature is attributed to the sketch of Vincent. There is an even earlier sighting of him in issue 3, although he does not yet seemingly have a name. It would clearly take a while for the character of Vincent van Ghool to form. Eventually though, as a resident of the Castle of Frankenstein, Vincent could also be found in the mausoleum or interacting with other characters, such as Ygor. The two would supposedly go on adventures, have secret meetings, and host parties. Ygor appears randomly throughout CoF, but there were two examples (as seen in Fig. 21 and 22) where he came before the table of contents to welcome readers, indicating that he is their host on their journey through the 'castle' (or contents of each issue); he is also the keeper of the Gothic Castle. This journey further paints CoF as an interactive, almost ‘choose-your-own-adventure' style publication, which helps create and maintain a relationship between CoF and their readers. In addition to interacting with readers, Ygor also interacts with the editors. As illustrated in Fig, 23, he shames the editors for spelling his name wrong. Ygor acknowledges that the magazine is sometimes victim to bad editing and typos. bottom of this page under Genre. What is it about horror films? And why would people want to read about them? 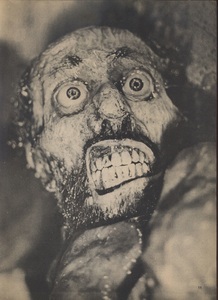 Image introducing The Texas Chainsaw Massacre (1974) feature. The Stranger makes us nervous . . . Fig. 24: What's left of Professor Nolter in The Mutations (1974). Stephen King, as noted at the beginning of this exhibit, labelled Castle of Frankenstein a "monster mag" (142). 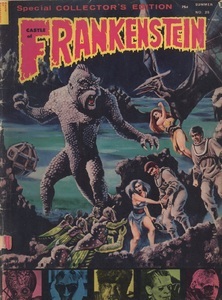 This designation applied to a few magazines in the twentieth century, such as Famous Monsters of Filmland, The Monster Times, and Fangoria—a magazine which began its publication in 1979 and continues to the present day. 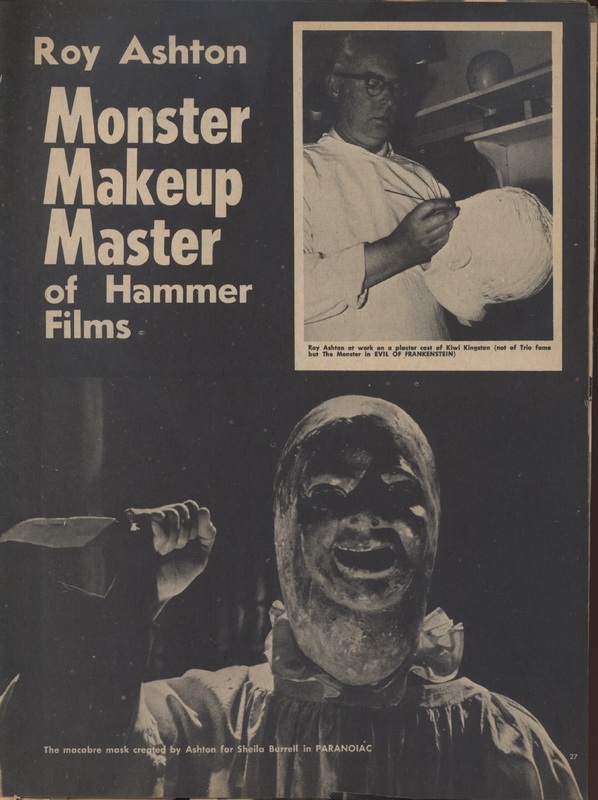 Although there seemingly exists no official definition of a "monster mag", these magazines are characteristically focused on the idea of the "monster," which can take many forms. For example, a monster may be the blood-sucking vampire Dracula, the distorted face of Professor Nolter (as seen in Fig. 24) in The Mutations (1974), the members of the cannibalistic family in The Texas Chainsaw Massacre, or the Pale Man from Guillermo Del Toro's Pan's Labyrinth (2006). These monsters are labelled as such for their appearance, actions, or both. This attractiveness is what draws readers to the majority of the subject matter in CoF, and it's something CoF is aware of. In Fig. 25 it is noted how CoF consciously chooses to put the villains on the front cover. Although this remark was made in regards to CoF's Batman issue, time and time again CoF flaunts the villain on their front cover. Examples of this can be seen in the gallery below. 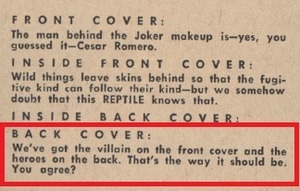 This illustrates how CoF believes, or perhaps knows, that there is such attractiveness to the villain that they are able to sell magazines by spotlighting the villain's image. 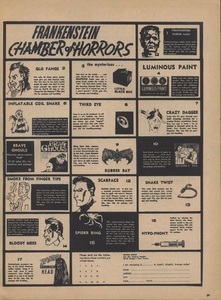 In addition to featuring the villain on the covers of their issues, CoF also designates much of their inside content to highlighting details about villains, monsters, and the "bad guys" of horror films. However paradoxical it is, CoF finds much of its success in their audience's love of villainy or evil. Who was reading Castle of Frankenstein? Fig. 26: Letter from Jerry Tillotson. Fig. 28: Letter from Steve and Erwin Vertlieb. Fig. 29: Letter from Thomas Scofield. 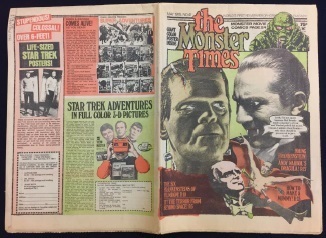 Jim Warren gave a magazine interview in which he stated flatly that his Famous Monsters of Filmland [CoF’s main competitor] was cleverly calculated to hit a nine- to twelve-year-old market. When I read this I quite consciously began slanting CoF toward a nine- to sixty-five-year-old market on the theory there are more people! Bhob Stewart was ahead of his time in many literary and graphic areas, but his approach tended to be more esoteric than practical. He gravitated toward underground comics and newspapers, and other limited circulation publications that were popular in large cities but not in the middle America hinterlands and boondocks where most of CoF was sold. Our intellectual tastes were therefore hyped up on some occasions, while my commercial sense would evaporate, and we’d see the result in lower sales. Although CoF did not purposely limit their audience, the fact that its distribution was more likely to reach areas with smaller, perhaps more rural, populations meant that CoF was limited to a specific readership, which arguably effected which economic classes were reading CoF even if the content within CoF was not purposely imposing these limitations. Overall though, if fans could access CoF, they could engage with it no matter their background. I have occasionally met young filmmakers, artists and writers who grew up on CoF. Apparently, as well as I can ascertain, the zine picked up many first-time readers with 11. I get a great satisfaction out of hearing how these people were ‘educated’ by CoF when they were in their early teens … These young people who are former CoF readers who are now involved in various creative pursuits make me feel I succeeded in getting this point across. Stewart correctly touches on not only the creative value of CoF, but the educational value. This educational value was also noted by reader Jerry Tillotson, as shown in Fig. 26, who explains how CoF had found its way into academic circles. This is, arguably, reflective of how Kendall R. Phillips states: “[by the mid-1960s,] [b]eginning in France and slowly spreading to America, films were increasingly embraced as their own form of literature” (92). If film could be interpreted as literature, it was necessary for literature about film to become commonplace, and perhaps even popularized and mainstream—even literature which presented itself within the pop culture market. Phillips acknowledges that “[p]rior to the 1950s and 1960s, films were largely conceived as low culture, but on both sides of the Atlantic, individuals were beginning to champion the medium of film” (92). Arguably, horror was considered even more "low brow" than other genres, so it was vital to horror's success to have bridges which connected horror to academia and other standards of acceptability. CoF, and its readers, helped build this bridge. There is, however, a danger to the hierarchy of horror fans, as Matt Hills notes in The Pleasure of Horror, in response to Mark Kermode: the “discursive problem” with the “Romantic-intensity-turned-to-cool-knowledgeability” origin story of most horror fans “is that while knowledge and ‘literacy’ can be used to distinguish and revalue the adult, ‘tortured’ horror fan—the reader of horror’s niche magazines and participant in fan cultural activities—such discourses cannot logically or readily account for why horror so affected or inspired the proto-fan in the first place” (77). It is hard to account for why horror inspires the “proto-fan”, although a conclusion could be drawn from the earlier conversation about the appeal of the villain. What is important, however, is how CoF fostered an environment where the “proto-fan” could exist beside the 'true' horror fan. CoF primarily provides materials for the film buff—TV Movieguide, in-depth articles with directors and actors, features on specialists in production teams (such as that which is shown in Fig. 27)—but they also present material for the “proto-fan” who is looking for a gateway into the world of horror, such as nine year old Thomas, who wrote to CoF to express his affection for a particular reoccurring feature (Fig. 29). Arguably, even fans who read CoF for the science fiction or fantasy content would be exposed to their horror content as well, or hybrids of the genres such as horror-science fiction, and could therefore be fans in the making, waiting for the right window of opportunity into the world of horror. I think that all film categories and genres should be studied. I’d evince a predilection for the b’s and z’s because this is where one finds the filmmaking DNA code. Because of their limited capital, the b’s and z’s involve a certain self-discipline and structure that is, more often than not, sincere and direct. I feel that an interesting and successful a-film may only be a b-film on a bigger budget. the "lower" the quality of film. Curious about what an avid film buff, horror fanatic, and/or reader of CoF would actually look like? Travel back to the 1960s and find out! In its early days, Castle of Frankenstein would post photos of their readers alongside their letters. Examples from issue 2 can be seen here, here, and here. Fig. 30: Editorial written by Calvin T. Beck. Issue 20. As noted above on numerous occasions, CoF often had problems with distribution. This problem was also noted in other sources. For example, Cotter's study complains that “the most maddening thing about CoF[,] even if you were an ardent fan, [was that] you never knew when the next issue was coming out[,] [which] was mostly due to the caprices and finances of its editor, Calvin T. Beck” (59). Voger expresses a similar sentiment: “A downside [of CoF] was [their] erratic publishing schedule” (138). Magazine publishing is, by its very nature, a commercial, not artistic, business. Although I’ve some insight in marketing, I’ve never been a very commercial type of person. And it’s terribly difficult trying to wear two hats at one time without getting a little schizoid — that is, trying to be in business and creative simultaneously … One’s creative well being is strained trying to maintain regular schedules which conform to the establishment’s theory of productivity. This may explain why most minor magazines are infinitely superior and why most mass market mags are [s***] … In a nutshell, good wine takes time. CoF’s twenty-seven editions—including Journal of Frankenstein and the 1967 Fearbook—include some disappointing editions. But as a whole, CoF couldn’t have made a lasting impression if it had taken a purely commercial route. In the long run, it established certain principles that may have helped inspire others to do likewise or better. Last issue we revealed some of the problems our publications had for a long time getting proper distribution in various areas around the country. Quite a large number of you reacted magnificently, it seems, and CoF is now being seen to better advantage. And we’re all quite ecstatic over this beautiful display of loyalty. The conclusion one can draw from this is that CoF predominately relied on its readership—the people who shared their value of creative endeavor over mass marketability—to extend its distribution rather than funding from more established publishers and distributors. Beck also acknowledges in the excerpt that better distribution is not just for the sake of CoF reaching more people, but about readers having access to publications they want. Beck acknowledges a very important problem: limited access, or perhaps zero access, to certain publications or other forms of media is a form of censorship. As a member of the community of journalism, CoF is against such ideas and the dangers they impose, and they believe that their community of readers are similarly against censorship. What’s also important is that they explicitly invited their readers to “share” in the victory of battle should they succeed, and are therefore making their relationship with their readers more personal. They have extended an invitation of comradery in battle and have similarly expressed a division of the treasure should they succeed. How did Castle of Frankenstein's layout cater to its readers? "The setting, surroundings, or background of any event or action." the arrangement of a scene involving props, characters, setting, etc. and illustrations; (also) the composition or layout of a picture." Fig. 31: Letter from Jeff Day. Fig. 32: Letter from Ron Peterson. CoF's relationship with, and accountability to, its readers meant that they did have to please their audience, albeit while remaining true to their own vision of CoF. CoF’s relationship with their readers, beyond the conversations mentioned above, also spawned a creative collaboration which helped determine layout design. Fig. 34: An illustration featuring a simplified title of "Letters," which came after "Ghostal Mail," but before "Castle Mail Box". Fig. 35: "Ghostal Mail" changed to "Castle Mail Box" in later issues of CoF. Fig. 36: As seen in issue 24, CoF added a watermark to their letters section, which arguably made it harder to read the print. Fig. 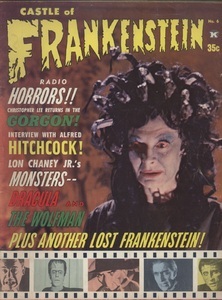 38: "Frankenstein at Large" header, which seemingly replaced the "Noosereel" illustration for reviews of films. Fig. 39: Letter from Bill Warren. Another aspect of CoF's layout which drew criticism, as reader Ron Peterson (Fig. 32) stated, was their supposedly “corny” department illustrations (illustrations which accompany the titles of the various sections of the magazine.) This sentiment was mirrored by reader Bill Warren (Fig. 39), who stated that sections such as “Ghostal Mail” and “Noosereel” were “juvenile”. Eventually CoF would change some of their quirks to cater to their readership's criticisms and suggestions. "Ghostal Mail" (Fig. 33) eventually became "The Castle Mail Box" (Fig. 35) and "Noosereel" (Fig. 37) seemingly became "Frankenstein at Large" (Fig. 38). However, it's possible these changes weren't as monumentally successful as they had hoped since distribution and sales did not increase and CoF ended shortly after. The last issue of Castle of Frankenstein was released in 1975—a year after what Phillips refers to as “the pinnacle year in the history of the American horror film[,]” as it saw the success of two iconic films: The Exorcist and The Texas Chainsaw Massacre (101). 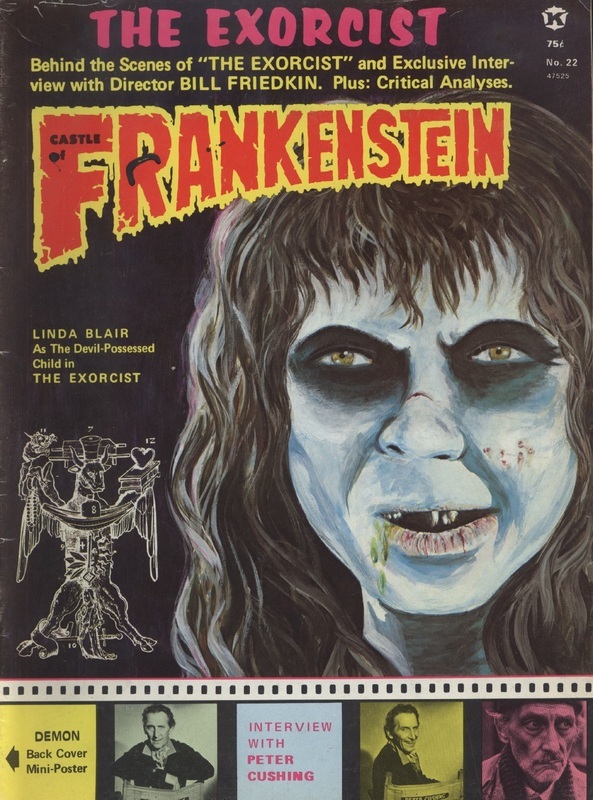 CoF gave immense attention to The Exorcist over the course of two issues—issues 22 and 24, both of which are in Special Collections. 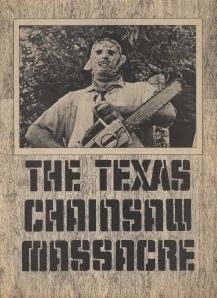 The Texas Chainsaw Massacre was given a three-page spread in their last issue, 25. The Exorcist, in particular, “provided an unprecedented ‘visceral visual onslaught.' 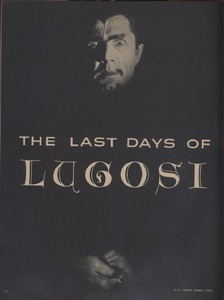 The technical skill and excellent pacing of the film attracted not only enormous popularity but also unprecedented critical acclaim for a horror film” (Phillips 105). Similarly, “Texas Chainsaw took the familiar tale of the psychotic killer and simultaneously distorted and amplified it. As Carol Clover notes, Hooper’s film provided a crucial bridge between Hitchcock’s Psycho—the insane killer, the remote location, and the confusing issues of gender and sexuality—and the slasher films of the 1980s, films such as Halloween and Friday the Thirteenth” (Phillips 106). I was also acquainted with a fine and sensitive friend at Kable News, the vice-president who heard and understood all my woes. He’d just been appointed for a short time. He was a freak in the business world: friendly, warm and intelligent. It was a liaison I’d always wanted but never could find until now. My sales shot up like magic. Tragically, my friend Andre soon died from a massive heart attack. So passed away one of the nicest people I’d ever known. And after that, everything went downhill. CoF sales dropped as quickly as they shot up. Quite frankly, I’d had enough and wasn’t about to undergo the same painful perseverance I’d endured in the 1960s. I could have shopped around for another, perhaps even healthier distribution climate, but what I’d already experienced left a bitter taste. However, through the issues in the University of Victoria’s Special Collections, Castle of Frankenstein lives on. These illustrate how a magazine/fanzine is an example of its circumstances, an adapting force to a changing environment, and an illustration of an unique relationship with its readership. Castle of Frankenstein has left an undeniable mark on the world of horror, and through Special Collections readers can continue to revisit its cultural and scholarly effect. which CoF is often compared to. Beck, Calvin T. Interviewed by Raymond Young. Flickhead, 2014, 21ca.com/flickhead/2_14_Beck_Interview.html. Beck, Calvin T. Reply to Ron Peterson. Castle of Frankenstein, vol. 5, no. 4, 1973, p. 4. Beck, Calvin T. Reply to Gary Kimber. Castle of Frankenstein, vol. 5, no. 4, 1973, p. 52. Carroll, Noel. "Why horror?" Horror: The Film Reader, edited by Mark Jancovich, Routledge, 2002, pp. 33-45. Libraries Special Collections, PN1995.9 H6C3. Hills, Matt. The Pleasures of Horror. Continuum, 2005. Kimber, Gary. Letter. Castle of Frankenstein, vol. 5, no. 4, 1973, pp. 52. Monaco, Paul. History of American Cinema: The Sixties. Edited by Charles Harpole, vol. 8, Charles Scribner's Sons, 2001. Phillips, Kendall R. Projected Fears: Horror Films and American Culture. Praeger Publishers, 2005. Stewart, Bhob. Interview by Raymond Young. Flickhead, 2014, 21ca.com/flickhead/2_14_Bhob_Interview.html. Voger, Mark. Monster Mash: The Creepy, Kooky Monster Craze in America 1957-1972. TwoMorrows Publishing, 2015. Waller, Gregory A. "Introduction to American Horrors (extract)." The Horror Reader, edited by Ken Gelder, Routledge, 2000, pp. Wertham, Fredric. The World of Fanzines. Southern Illinois University Press, 1973.